Shakira and Travis Morgan, The Warlord, are travelling along when Morgan sees a horse he must try and tame. It just so happens to be a Pegasus, and when Morgan gets on, it takes him away to some strange citadel high up on a mountain. Exasperated, Shakira is just about to follow him when she has a run-in with a centaur, and after a little misunderstanding, and some flirting, the centaur takes Shakira to the same citadel so that she might go after our hero. Inside Morgan is admiring the artwork and how everything seems so detailed and after meeting the woman who owns the place, finds out not everything is as it appears. 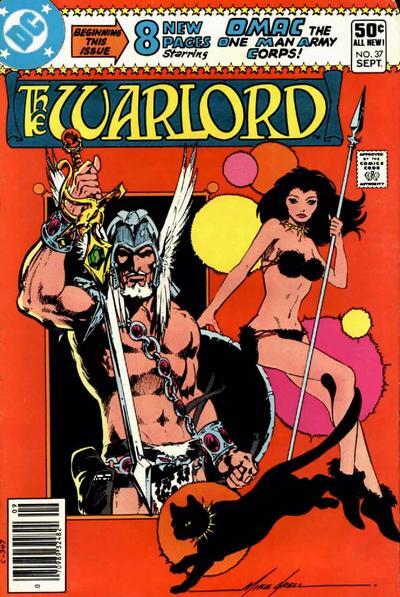 This was quite the entertaining little tale by Mike Grell. He brings in some more magical and mythical creatures to populate Skartaris with this issue, which is quite all right, but it is starting to seem like anything that can exist, does so in this hidden world. The title also seems a little directionless as well for the moment. Usually Grell has a goal for our hero in mind and he moves Travis towards it. Presumably, that goal is to still reach Shamballah, but it is taking an exceedingly long time to get there. Shakira is turning out to be a great supporting character and it will be nice to learn some more of her origin at some point. The fact that Morgan has not made any moves towards her as well is kind of strange, but good to see. This issue also happened to have a backup feature with OMAC, the One Man Army Corps. Written and drawn by Jim Starlin, it was essentially just an introduction with his origin tale as well as a new costume by the end of the book. Good stuff by both creators.